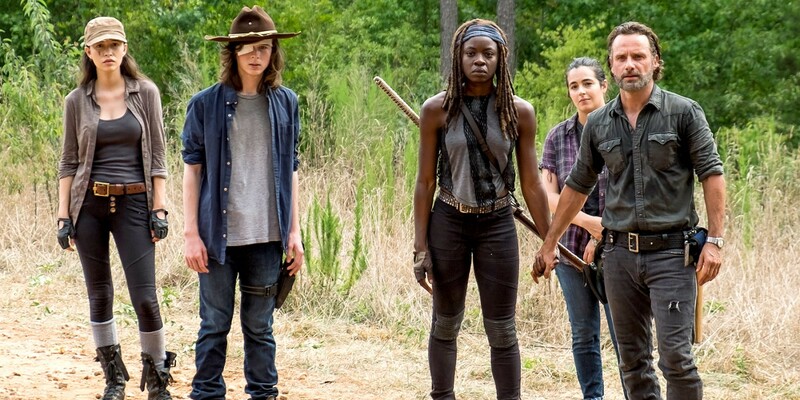 The Walking Dead executive producer and CEO of the show's production company, David Alpert, has provided his take on the AMC zombie drama's declining ratings in season 8. Currently on its mid-season break, The Walking Dead left viewers on an almighty cliffhanger by revealing that Rick Grimes' son Carl had suffered a zombie bite while helping Siddiq to Alexandria. This revelation comes just as Rick and co.'s war against The Saviors took a turn for the worse, with Negan and his cohorts peppering Alexandria with a barrage of explosives and attempting to re-assert their dominance over at The Hilltop and The Kingdom. While The Walking Dead's current "All Out War" arc pitting Rick against Negan may be one of the most acclaimed runs in the original comic series, that popularity isn't being reflected in the AMC adaptation's viewing figures. Having broken cable TV records in past seasons, The Walking Dead's current run is struggling to match the statistical heights of its predecessors, with its mid-season finale episode posting the lowest ratings since the show's second season. Picking through the business jargon, Alpert is essentially claiming that television audiences are less inclined to sit down and watch an episode of any series when it first airs and now prefer to catch up at a later time, by either using an on-demand service or digitally recording the episode. Alpert appears to very much refute the idea that The Walking Dead's falling viewership is down to the show itself having declined in quality or that fans have become tired of Rick's zombie apocalypse adventures. On one hand, Alpert certainly raises a salient point. Catching up on missing episodes of a favorite series is now easier than ever before and it makes sense that audiences would rather watch an episode of something when it suits them than rush to sit down in front of the television at a specific time every week and watch each episode when it goes out live. Interestingly, the stats support Alpert's claim. Taking into account DVR figures, the amount of people who watched The Walking Dead's recent mid-season finale rises by over 4 million, putting the show in a distinctly healthier standing. However, if Alpert's suggestion was completely accurate, there wouldn't be any drop in the critical reception to season 8 of The Walking Dead compared to past seasons. In actual fact, there is a close correlation between The Walking Dead's falling ratings and an increase in negative reviews and this suggests that while on-demand services can account for some loss of viewership, some fans are simply turning off.